Romans 9 has been a theological battleground for centuries. Scholars from all perspectives have debated whether Paul is teaching corporate or individual election, whether or not God truly hates Esau, and how to understand the hardening of Pharaoh's heart. Both sides have accused the other of misrepresenting God.In this book, J. D. Myers presents a mediating position. 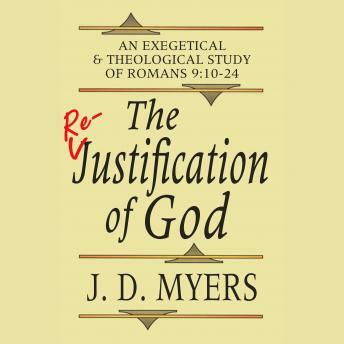 Gleaning from both Calvinistic and Arminian insights into Romans 9, J. D. Myers presents a beautiful portrait of God as described by the pen of the Apostle Paul. Here is a way to read Romans 9 which allows God to remain sovereign and free, but also allows our theology to avoid the deterministic tendencies which have entrapped certain systems of the past.Read this book and-maybe for the first time-learn to see God the way Paul saw Him.